Real Force 24 Volt 9.6 Ah Phosphate Lithium Ion Battery Pack Specially Engineered Battery Management System enables Plug and Play use with all Currie RMB E-Bikes. Battery Life: Up to 500 cycles, Charge time: 4-6 hours. Warranty: 3 Years! Weight: Ultra Light 7lbs!. 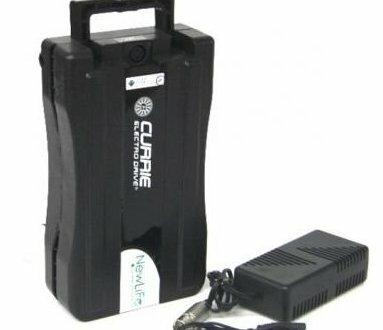 24 Volt Lithium Iron Phosphate Charger Included with purchase!.